There is another policy approach that neither prioritizes cutting deficits nor dismisses them. Unlike in the past, budgeters need not make reducing projected deficits a priority. But they should ensure that, except during downturns, when fiscal stimulus is required, new spending and tax cuts do not add to the debt. This middle course would tolerate large and growing deficits without making a major effort to reduce them—at least for the foreseeable future. But it would also stop the policy trend of the last two years, which will otherwise continue to pile up debt. This goes too far. When the economy is held back by lack of demand during a downturn, modern monetary theory gives similar answers to those provided by more mainstream Keynesian theory—that is, that more spending or lower taxes will have little effect on interest rates. But the modern monetarist approach is a poor guide to policy in normal economic times, when it would prescribe large tax hikes to control inflation—not exactly the policy its advocates highlight. In truth, no one knows the benefits and costs of different debt levels—75 percent of GDP, 100 percent of GDP, or even 150 percent of GDP. According to the best projections, the United States is on course to exceed these figures over the next 30 years. Although the U.S. government will remain solvent for the foreseeable future, it would be imprudent to allow the debt-to-GDP ratio to rise forever in an uncertain world. Trying to make this situation sustainable without adjusting fiscal policy or raising interest rates, as recommended by some advocates of modern monetary theory, is a recipe for hyperinflation. There is a widely held misconception that the deficit has risen primarily because government programs have grown more generous. Not so. Deficits have ballooned because a series of tax cuts have dramatically reduced government revenue below past projections and historical levels. The tax cuts passed by Presidents George W. Bush and Donald Trump totaled three percent of GDP—much more than the projected increases in entitlement spending over the next 30 years. Those cuts meant that in 2018, the federal government took in revenue equivalent to just 16 percent of GDP, the lowest level in half a century, except for a few brief periods in the aftermath of recessions. Without the Bush and Trump tax cuts (and the interest payments on the debt that went with them), last year’s federal budget would have come close to balancing. As things stand, however, the Congressional Budget Office projects that revenue over the next five years will continue to average less than 17 percent of GDP, a percentage point lower than under President Ronald Reagan. A lot of details would need to be worked out. Analysts will have to decide whether to exclude from their deficit calculations certain kinds of spending—such as infrastructure spending—that represent investments rather than current consumption. One critical question is whether analysts will use dynamic scoring, an approach that accounts for how a new policy will affect the economy when calculating what it will cost. Advocates of dynamic scoring argue that it provides more accurate cost estimates, but critics point out that getting the numbers right is tricky, so it’s easy to bake in overly optimistic assumptions and thus get almost any result you want. In truth, dynamic scoring is a useful tool, as long as it’s done right. Dynamic scoring is usually limited to tax debates. That’s a mistake, as nontax policies can also have significant budgetary effects. A wide range of experts believe that investments in tax enforcement pay off at a rate of $5 or more for every $1 spent. Although official scorekeepers gave only minimal credit to the cost-control measures in the Affordable Care Act, thanks in large part to those measures, cumulative Medicare and Medicaid spending in the decade after the ACA was passed is likely to end up coming in about $1 trillion below forecasts made at the time. Even if interest rates remain low, however, the do-no-harm approach won’t be sustainable forever. How long the United States will be able maintain its growing national debt will depend on whether deficits come in above or below current projections. Even so, the national debt presents just one of many problems the United States faces—and not the most pressing. Much more pressing are the problems of languishing labor-force participation rates, slow economic growth, persistent poverty, a lack of access to health insurance, and global climate change. Politicians should not let large deficits deter them from addressing these fundamental challenges. A do-no-harm approach would allow large and growing deficits for a long time, but it would put some constraints on the most ambitious political agendas. Progressives have proposed Medicare for all, free college, a federal jobs guarantee, and a massive green infrastructure program. The merits of each of these proposals are up for debate. But each idea responds to a real need that will take resources to address. Some 29 million Americans still do not have health insurance. College is unaffordable for far too many. Millions of working-age Americans have given up even looking for work. Global warming cannot be ignored. Add in the widely shared desire for more investments in education and infrastructure and the likelihood that defense spending will keep rising, and the federal government will clearly have to spend a lot more. The economics of deficits have changed. 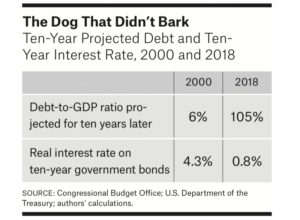 A better appreciation of the sources and consequences of government debt, and of the options to address it, should lead policymakers away from many of the old deficitand entitlement-focused orthodoxies—but not to wholesale abandonment of fiscal constraints.